I love making lists. Big-picture lists, daily lists, grocery lists, checklists … you name it, I list it. Lists are a personal thing—they speak to the ineffable in us—which is why it’s so enjoyable to look at how or what other people list. Once there was someone who found my lists so representative of me (or perhaps so neatly adorable) that he kept one as a memento. My stories and essays begin with lists. On whatever is at hand—and often in the margins or endpapers of books I’m reading—I jot down fragments in the order that my mind offers them. This first step is a purging of these pieces, without structure. It’s notating in shorthand what will go in the container, whether the container is an essay or a story. Go read the full piece for excellent insights and inspiration. To-Do List. A new list is posted every Monday. Milk Eggs Vodka. A wonderful website + book that focuses on grocery lists. If It Won’t Fit On A Post-It, It Won’t Fit In Your Day. Fabulous advice for managing your daily to-do list. Action Method journals. This is a marvelous tool (and method) for list makers. Also—I’m curious about other writers’ lists. Want to share a picture of yours, along with an explanation of how you use lists? If enough people are willing to share, I might start a feature on this blog. Drop me an e-mail or leave a comment if you’d be willing to participate. Posted in Creativity + Inspiration, Life Philosophy, Worksheets & Handouts. Jane, a great group of links, thanks. As a long-time list maker, I reflexively make lists for any project I get involved in. And I’m fascinated by other people’s lists. One of the secret pleasures of list lovers is coming upon someone else’s discarded list, it’s like a form of “found poetry” that implies the life behind the list. I even once wrote a blog post called The List of Lists, which was incredibly satisfying in a meta- sort of way. Thanks for the inspiration. When the greatest joy in life became ticking an item off a to-do list, I knew I needed to get a life. I love lists! I don’t have much at the moment but I can’t wait to see how others organize a crazy life. I usually have a monthly objective list, wishlist, daily and weekly list as well as a calendar. I like to plan. I don’t make lists because I am the kind of person that will keep managing lists until the day is over – and continue the next day. Been making list for a very, very long time! 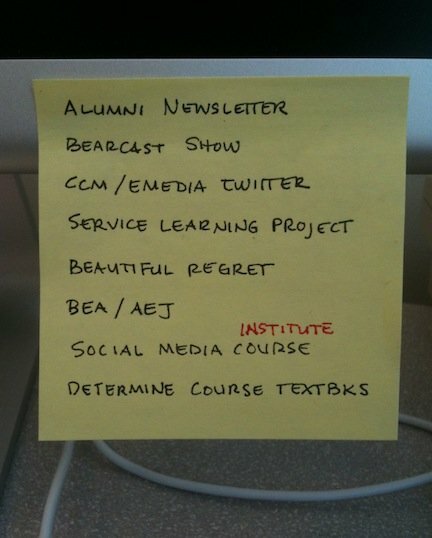 One of my favorite programs, is 3M’s Electronic Post-It Notes. Love being able to save them, back them up, etc. Just wondering if you ever heard of them. They are just like the regular post it notes and ya can print them too! I haven’t heard of the 3M software. Since I use Mac at home and work, I have the free application called “Stickies” (and right now, I have about 15 minimized on my desktop)! Love the tip about use of lists in journaling! Thanks so much for taking the time to share. Lists save my life in the revision process. I make and plough through list after list to make sure I’ve gotten everything. For revisions, the list helps take out any emotional turmoil I may be feeling about writing. It gives me concrete steps to take. Without lists, I don’t think I could have written a novel. Great insight! I’d consider lists essential for book-length revision. Agree about importance of deadlines! Kind of related, but really a tangent: There’s an interesting to-do tool I didn’t mention because it’s a paid service (but I once used it) called GooToDo (http://goodtodo.com/). For me, it stressed the importance of keeping track of my to-do items in relation to the day/week they needed to be done, so they weren’t clogging up my list weeks or months earlier & taking up mental space. That said, for really long-term projects with competing deadlines and multiple collaborators, I use a more powerful tool (again, a paid service) called Basecamp (http://37signals.com/). David Allen writes in “Getting Things Done” how extremely effective list making can be, especially when your group the things on your lists by context; i.e. referring to the tools or resources you need to act on them. I use the electronic list makers, “Outliner” and “Omnifocus”. Both very useful tools. Thanks for mentioning! I’ll check those out. Timely post for inspiration. With some impending deadlines, I’ve had to go into list consolidation mode right now! And, as a I recall, you are another adorable list maker. I keep around a ton of extra Moleskine notebooks for just the purposes you describe. I enjoyed your article. I’m a list maker too; anything to simplify my life! I keep a pen and paper in every room and, when I think of something that I want to be sure I’ll remember, I jot it down. That way, I don’t have to struggle later, wondering, “What was it that I was supposed to remember?” A lot less stress and frustration! I wanted to mention that I enjoyed meeting you a couple of years ago at the Mad Anthony Writers Conference. In your talks, you gave us a lot of information on how to achieve an online presence and how important that presence is in these changing times in publishing. It’s taken me awhile to “digest” the information. I may have completed writing two women’s suspense novels but I’m a novice when it comes to blogging, etc. Please excuse the “two” postings below; there should’ve only been one! Live and learn, I guess. I toughed it out and came out with a list of 70 things. Now all I have to do is, uh, DO them.Reading this has helped me a lot today! Wow!! Please suggest some to-do list for my blogs as well.